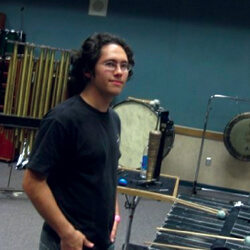 Philip Idell, 19 University of California, Los Angeles Pacific Crest Front Ensemble, 2009 How did you choose your corps? I chose Pacific Crest because of its proximity to the Los Angeles area and the convenient integration of its rehearsal schedule around the University of California quarter system. In your experience, what's the best way to prepare for an audition? I find the best way to prepare for an audition is to start practicing early and work on the material a little bit each day, rather than cramming a few days before the audition to learn it all. If you need to prepare a solo piece, it is important to choose something that is representative of your skill, rather than trying to prepare a piece that is way beyond your reach. It will be less stressful in the long run, and you will have more time to work on other parts of your audition. What can a prospective corps member expect when he/she shows up for an audition weekend? I think more than anything, a prospective member can expect to be challenged when he or she shows up for the auditions. The staff will want to push you to see what you are capable of, and the better you handle it, the better off you will be in the end. The first time you auditioned, was the process different from what you expected it to be? The Pacific Crest Web site laid out the audition format fairly clearly, so luckily there weren't any real surprises or shocks for me over the audition weekend. Were you nervous at your audition? For me, the most nerve-racking part of the audition weekend was when I played individually in front of the percussion staff. Before I entered the room, I took a few deep breaths to calm myself down and told myself that no matter what happened, it would be over in a few minutes. What do you think is most important for someone to take away from the audition experience? I think the most important thing you can do at an audition camp is to learn as much as you can and have fun while doing it. Even if you don't earn a spot, you will have received instruction from some of the best teachers out there. That, in addition to simply enjoying your time participating in an activity that you are passionate about, will be worth the audition fees alone. Hopefully you'll even make some new friends in the process. Any other advice? The most important thing to remember at an audition is that the staff members look for a lot more than your playing ability. They also look at your attitude, your ability to adapt to comments about your playing, and your ability to learn music. So even if the guy next to you appears to have better technical chops, don't freak out. As long as you are smart and have a great attitude, you may not be as far away from a spot in the corps as you might think. Learn more about corps audition dates, locations and additional info.